The Boathouse Foundation last week donated $25,000 to the YMCA of Oak Bluffs, the sixth consecutive year the philanthropic arm of the Boathouse club in Edgartown has donated to the organization. “We are able to continue to offer financial assistance for affordable and free programs that promote a healthy mind, body, and spirit, and a stronger community, thanks to the generous support of donors like the Boathouse,” the YMCA’s director of mission advancement, Sarah Soushek, said in a press release. 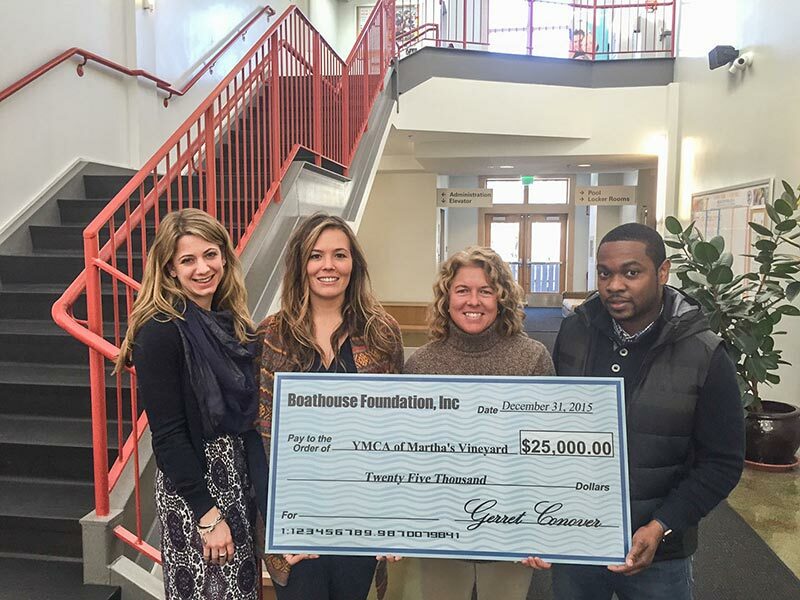 Boathouse officials visited the YMCA and presented the check on behalf of the club’s members, employees, and owners. The Boathouse is a private club on Martha’s Vineyard that offers recreational opportunities, including tennis, lawn games, a pool, spa, and fitness center, and seasonal programs and events. “We are delighted to be able to support the YMCA of Martha’s Vineyard, and have committed to making an annual $25,000 donation to the organization,” general manager Scott Anderson said. The foundation funds the donation with an annual contribution from members and owners.